Staying Safe During End-of-Year Clean-Up! The end of the school year is a peak period for strain and sprain injuries due to the increase in cleanup and furniture relocation tasks. Careful thought and planning is needed to develop the safest and most efficient way to undertake these tasks. Working together, all building staff can stay safe and healthy. Custodians have physically demanding jobs and take on extra manual handling jobs at the end of year, such as disposing of garbage as well as moving equipment and furniture. It is important to note that a number of these tasks are directly linked to injuries, so specific measures should be implemented for those most at risk of injury. Spread heavy loads equally between wheeled bins. Consider other waste disposal strategies such as taking garbage directly to industrial bins in manageable loads. Undertake a progressive cleanup over the last few weeks of school rather than leaving it to the final days of the school year. Do not overfill waste paper bins—remember small baskets are expected to be light when lifted. Placing heavy books or items in these bins increases the risk of injury for the person emptying the bin. Place waste paper bins on chairs or desks at the end of each day—this saves the custodian from repetitive bending. 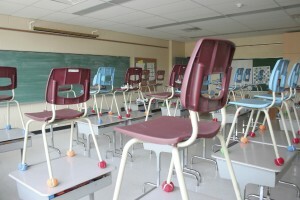 At the end of the school year, teachers are frequently asked to ‘relocate’ classroom furniture. Teachers are not furniture movers and often do not have the appropriate equipment, assistance, time, or training to complete these tasks safely. Leaving full filing cabinets where they are – only move files in small bundles. Moving personal items with the assistance of others. Think about moving only personal items rather than desks and filing cabinets. Using professionals to move heavy items. This is efficient and inexpensive when compared to the human and financial costs of an injury to a staff member. Planning moving activities like any other major project. The people involved, such as the schools officer and custodian, need to be consulted. It is important to ensure an adequate number of staff is available to assist on moving days. In addition, necessary equipment must be available and staff must be trained on how to use it. Staff should be reminded that their own safety is important, especially toward the end of the school year when there is an even greater temptation to rush to achieve deadlines. Work with colleagues and administrators whenever possible to manage major tasks such as relocation of classrooms. Plan the task. Take five minutes to think about the best and safest way to do the job: organize assistance, get the right equipment, and clear pathways. Ask for help; there is a big difference between what you can lift and what you can safely lift. Use the right equipment for the job. This equipment must be easily accessible and in good working order. 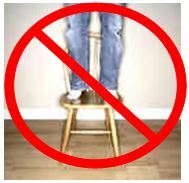 For example: use a small step ladder to reach items, not a chair or desk. Spread physical tasks over a number of days and allow your body to “warm up” in the morning before starting any heavy lifting tasks. Wear appropriate clothing and footwear for the job: bring spare “work” clothes and suitable footwear for moving or “clean-up” days. Don’t rush; spending the school holidays recovering from an injury will not be worth the five minutes you might save. Follow these tips to ensure a safe end to your school year!